LISA or less invasive surfactant administration is a method of administering life-saving surfactant to extremely premature lungs. Surfactant is a substance that prevents the alveoli in the lungs from collapsing when premature infants breathe out. Prior to the 1960s, death rates of premature infants from breathing problems accounted for around 10,000 deaths each year, but not all premature infants died - some 15,000 amazingly survived. Researchers eventually realized missing surfactant was the cause of death and rates of survival increased when surfactant was administered. However, the administration practices have yet to be perfected. LISA aims to deliver life-saving surfactant with less invasion, improving survival rates yet again. 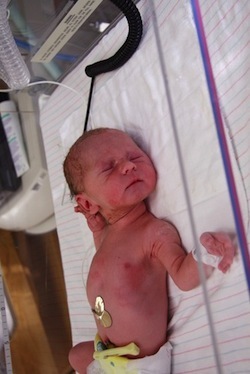 Researchers at the Medical University of Vienna used data collected at the Vermont-Oxford Neonatal Network to compare LISA with previous methods of surfactant delivery. When surfactant was administered using the LISA method, fewer cases of chronic lung disease, severe cerebral lesions and retinopathy of prematurity were reported. Infants were also less likely to need mechanical ventilation. Source: Klebermass-Schrehof K, Wald M, Schwindt J, Grill A, Prusa AR, Haiden N, Hayde M, Waldhoer T, Fuiko R, Berger A. Less Invasive Surfactant Administration in Extremely Preterm Infants: Impact on Mortality and Morbidity. Neonatology. 2013 Feb 22;103(4):252-258.